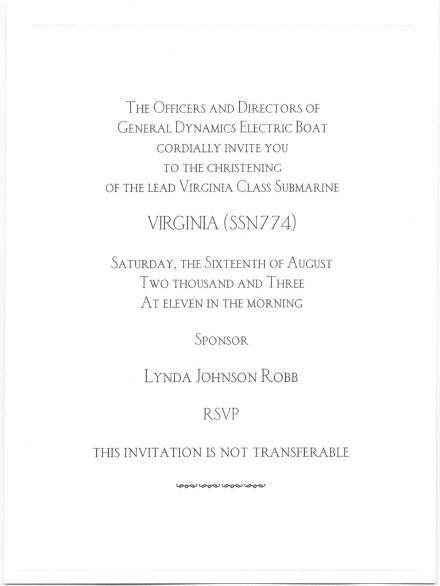 Although five members responded to the VIRGINIA COB's invitation for USS Virginia Base members to attend the christening by asking for and receiving formal invitations, only founding Base Commander Jack Winn and Webmaster Kenn McDermott actually made it to the 'launch' and christening. We understand the others may have gotten caught up in the commotion caused by the power outage that hit a number of eastern states on August 15th - which also affected New York City. On this web page we include a newspaper article describing preparations for the launch (click here to go directly to this article), We're sorry to report that cameras were banned from the site, but we have some great photos of the boat being moved into position for the launch and some of the christening ceremony itself that Kenn grabbed from the web (Click here to go directly to the photos). 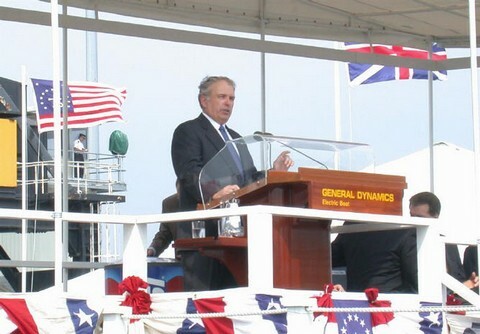 Then we include founding Base Commander Jack Winn's story about attending this event with Kenn McDermott (click here to go directly to Jack's story). We all had to send back an RSVP card that came with the invitation that included our full name and social security number so they could run a brief security check on us as we were given seating in what could only be called a VIP area. Our special passes arrived in the mail August 7th. 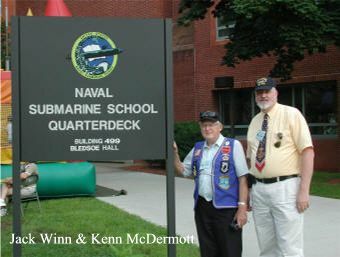 Kenn and Jack drove up together on Friday in Kenn's new (2003) Mercury Grand Marquis and shared a room at the Navy Lodge: Naval Submarine Base, New London, CT (which all boat sailors know is actually in Groton, CT). 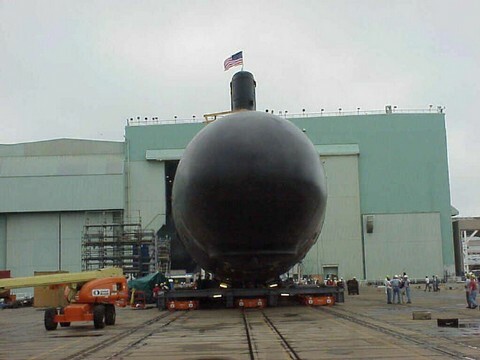 Groton — The first of the Navy's new Virginia-class submarines moved to the water's edge Saturday, as workers at Electric Boat finished lowering the nuclear-powered sub into a dry dock. 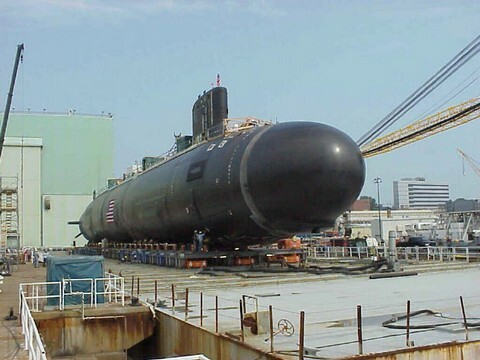 The 8,000-ton submarine was painstakingly lowered onto a pontoon in a process that began Friday afternoon, said EB spokesman Neil Ruenzel. 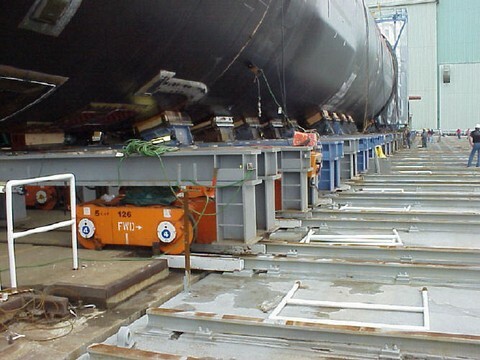 Workers will flood the dock with water and sink the pontoon, allowing the sub to float free, Ruenzel said, shortly before the boat is christened in an Aug. 16 ceremony at the shipyard. 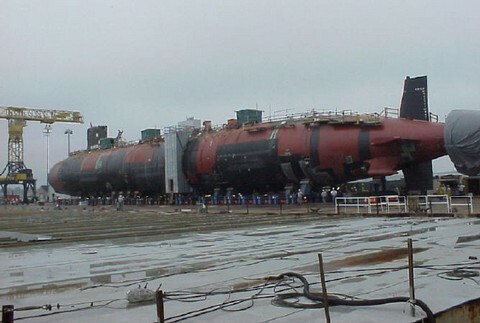 The 377-foot Virginia, the first of 30 of its class to be built by EB and Northrop Grumman Newport News Shipbuilding, a Virginia-based shipyard, will carry up to 38 Tomahawk cruise missiles and torpedoes. 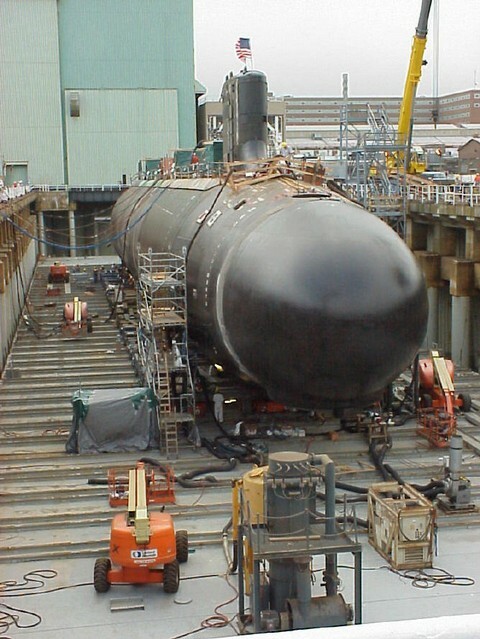 The Virginia is powered by a nuclear reactor that is designed to not need refueling during the planned life of the submarine, unlike current subs, Ruenzel said. “This is a more advanced, more capable submarine” than any other in the Navy's fleet, Ruenzel said. 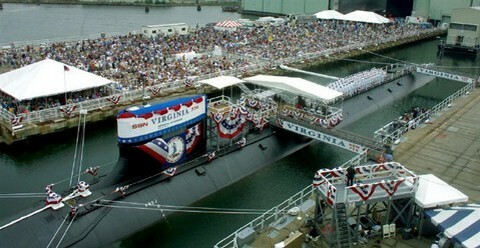 The Virginia will be delivered to the Navy in about one year, according to Ruenzel. 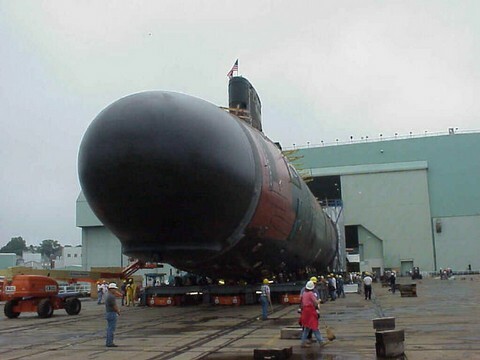 The class replaces the Los Angeles class of nuclear submarines. Capt. David J. Kern, a 1981 graduate of the U.S. Naval Academy, will captain the first vessel, with a crew of 132 officers and men. 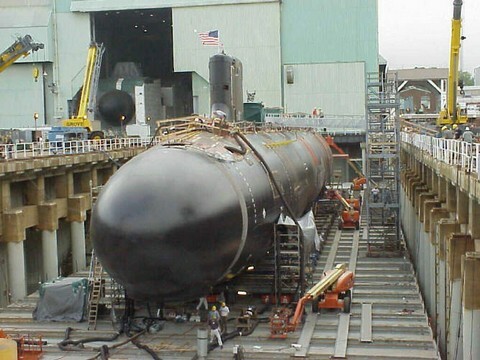 The second boat of this class, Texas (SSN-775), is under construction by Northrop Grumman Newport News Shipbuilding, Newport News, Virginia. 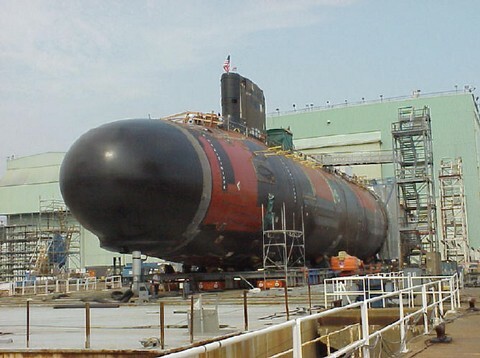 It will be christened later this year and delivered to the Navy in 2005. 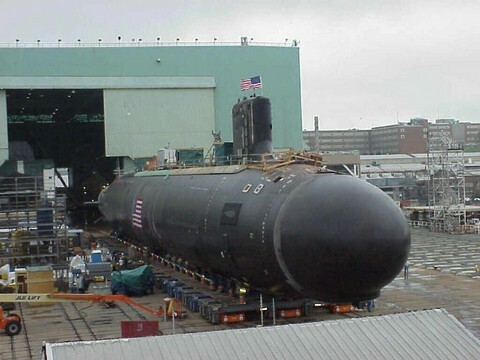 And the Webmaster wishes to thank Jay Richardson, NUWC Divison, Newport Submarine Simulation/Stimulation Development for bringing this article to our attention. Thanks Jay! Here are some great photos of the VIRGINIA being moved out from the Assembly Building and into the elevator dry dock where she will be floated for the Christening ceremony. 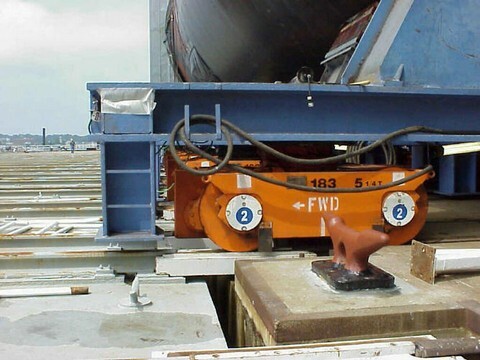 They no longer "slide down the ways", but are instead slowly moved and lowered on a platform to prevent damage. Please note that they are painting her as this approximately three-day evolution takes place. Note: If you look near the upper left of this photo you can just see the bow of the JIMMY CARTER - the third and final of the SEAWOLF class boats - which we walked beside enroute to the commissioning area. 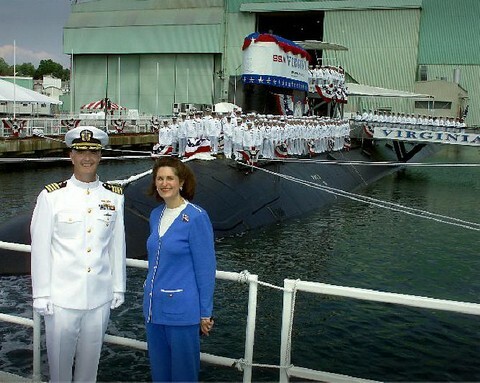 USS Virginia Base members were invited to attend the christening of their name sake, USS Virginia, in Groton, Connecticut, 16 August 2003. Our host was the Chief of the Boat, Casey White, MMCM(SS). Five of our shipmates decided to go to the christening but only two of us actually attended. The others were delayed due to the massive power outage on the East Coast. Our web master, Kenn McDermott, and I drove up in Kenn's new (2003) Mercury. We took the Eastern route through Scranton, PA to Hartford and on to Groton to avoid the problems we had heard about in New York City. When we stopped for gas in Port Jervies, New York I found the phone number of my old Skipper of the Carbonero who is now living in that area. He invited us over for a beer and we accepted. We had last been on the "Burner" together in 1966. He has since retired. It turns out that he and Kenn had worked in the same building (the OPCONCEN on the CINCLANTFLT Compound) in Norfolk after leaving the "Burner". Continuing on we got to Groton in about 12 hours after leaving Richmond. Our accommodations at the Navy Lodge at the Sub Base were outstanding. A nice room with a kitchenette and two double beds. Saturday morning after breakfast at the local IHop we went to the Electric Boat yard where parking was provided. We rode vans down to the dock in the yard and sat in the front row of the viewing area under a canopy. We looked directly across the dry dock, now filled with water and the Virginia now floating. 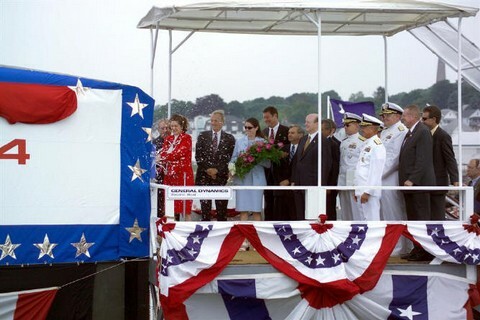 A large deck was provided for the dignitaries, while the crew assembled aft. Lynda Bird Johnson Robb, former president Johnson's daughter and former U.S. Senator Chuck Robb's wife, was the sponsor. Many speeches were made by politicians, including George Allen of Virginia, followed by the breaking of a bottle of Champagne on the after part of the sail. Food and drinks were provided to all the approximately 8,000 people attending. The whole ceremony was very impressive with a Navy band providing lots of shipping over music. After the ceremony we went to a ship's store across the street from EB where souvenirs where being sold to benefit the Virginia's morale and recreation fund. We bought T-shirts, cups and other items to remember the event by. Departing the shipyard we drove to the Sub Base where a ship's picnic was in progress. We were not only invited to the picnic but also to visit the Ship's trainer. It is an exact replica of the control room of the Virginia including an actual moving platform. Kenn and I were seated in the Pilot and Copilot seats, formerly the planesman and the helmsman, and allowed to operate the touch screen computers located directly in front of two very comfortable and adjustable chairs. We were shown how to operate the vessel by touching a screen. I was ordered to a depth of 600 feet. I touched the button on the screen labeled depth, then went to the keyboard and touched 600 then Enter. Immediately we felt the trainer pitch forward simulating the boat diving while watching a picture of the boat on the screen. Across the top of the boat were numbers representing the depth to the surface and under the boat depths to the bottom. For an old diesel boat sailor this blew my mind. Not only was the boat completely controlled by computer touch screens including compensation and a million other things, but the depths and speeds were beyond my limits. The order to take her down to 600 feet when the test depth of my last boat was 312 feet made me feel like Buck Rogers on his way to the moon. Another outstanding thing were the members of the crew that we met as well as some of the officers. We were treated like royalty, with much respect. I was especially impressed by the high intelligence of these men. They bent over backwards to explain everything to us with a great deal of pride. I can tell you old sub sailors out there that we are in good hands with these shipmates. One side note: When we arrived in Groton we contacted the COB and asked him where there was a good place to eat. He advised us to go to the Mohegan Sun Casino up river from Groton off Route 12. We drove up and could not believe what we saw. Words can not describe the size and opulence of this casino. It rivals anything I have ever seen in Vegas or Reno. Dozens of restaurants, shops and miles of gambling tables, slots and wheels. There was even an indoor waterfall. The first restaurant we went into offered a Filet for $100. We passed on that and found the same thing at a sports bar for 20 bucks. The place looked to be overflowing with people but we were told it was a slow night due to the power outages in New York and Boston. I would hate to see this place on a busy night. All in all the trip was one of the most outstanding things I have done in recent years. I am sorry all of you missed it. 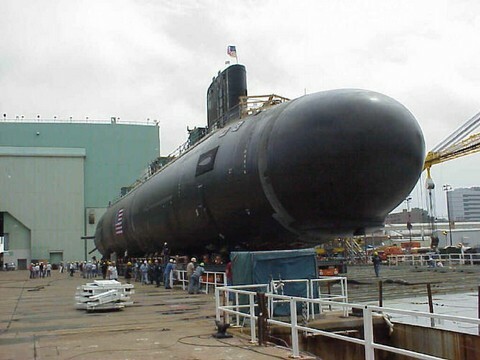 The boat is due to be commissioned, possibly in Newport News or Norfolk, next July so maybe more members can make that.